Riscure is working to improve the automation of attacks using new and advanced technologies. Deep learning already proved to bypass some of the limitations in side-channel attacks, like clock jittering and misalignment. However, to achieve this, the user must carefully fine-tune the neural network by selecting around twenty different hyper-parameters. This can be done manually or the Inspector Deep Learning module can help with this by doing an automated search based on manually set ranges for the hyper parameters. This task can be very challenging, especially when the user has limited experience with neural networks. In the upcoming Inspector release, 2018.2 that is planned for May, Riscure solves this problem by implementing a genetic algorithm in the Deep Learning module. With the automated hyper-parameter search using the genetic algorithm, very few bits of knowledge about neural networks is sufficient to tune the network. The extensive options to configure the network manually will still be available to suit the needs of more experienced users. In the chart below the results are visible. 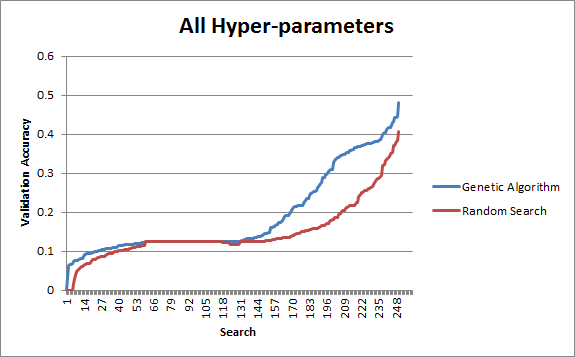 In this chart the random search for hyper parameters is compared to a search based on a genetic algorithm. The search was performed on all possible hyper parameters with an assumption of no knowledge on the desired neural network. We can see from this chart that genetic algorithm outperforms random search. More specifically, the accuracy is much higher for most of the searches. 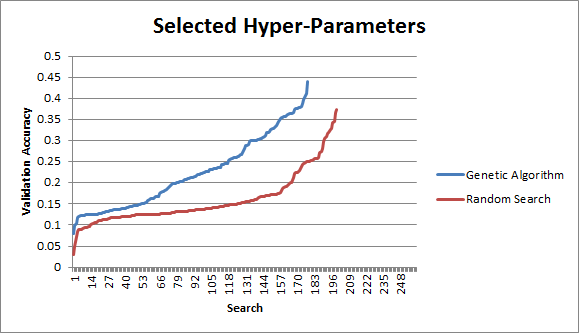 The second chart shows the result when we perform the search on a reduced number of hyper parameters. This is done to verify if with the help of the genetic algorithm the performance of a neural network can be improved. The results obtained with the genetic algorithm are much better. Riscure will continue to investigate options to improve the way the genetic algorithm is used for hyper parameter search, but already subscription customers can look forward to a big improvement in the upcoming release.